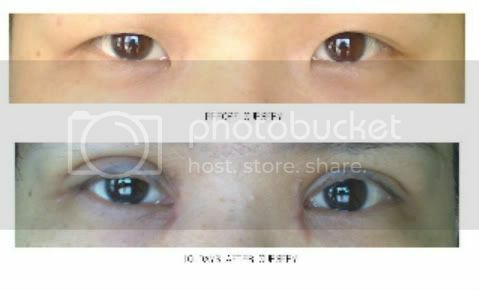 I will be going for a dbl eyelid surgery with dr chi on 3 March. Anyone who will be at Hatyai at that time? I am using scar gel for my epi already for the eyelid i just use the gel cream he provided ..
My epi is also same , one is with Z incision not reddish but one abit reddish fading color..
can i know if you feel any stitches inside because he said my stitches is dissolving type and will dissappear in 3 months and also say that there will be permernant stitches inside which make me a lil confuse and worried. When you touched you eye lid do u feel the stitches or something inside..
My eyelid is pretty high and i am really afraid. Thanks. Do you know what is the cream that he gave us? My eyelid now still uneven, right side is more swollen and feel like cannot open all my eye. Mine stitches also is dissolving type, the nurse told me that the stitches will dissolving after 7 days. Let me use the cream for 7 days. I keep continue use the cream that he gave it to me, yesterday, already feel the stitches start slowly disappear. I never feel any stitches on my eyelid or my epi scar. But after surgery, the eyelid and epi wounds are in black line. Now the black line already slowly disappear since yesterday. I dont know leh.. I was giddy after the surgery my sister tell me the nurse say just apply on the "sticker" , Mine abit uneven only , one incision look really scar-less like tiny black line but one abit red but i everyday just keep on apply the thing he give me . Dr say after i use finish the one he gave i can start using silicone gel and Dermatix gel but i bought Mederma one so i nv buy those.. maybe u try buying silicone gel he say that one is the common one..
My epi i don't really see any stitches at all maybe i am blind haha ! For my eyelid i can feel something inside , and he email me say it will slowly disappear in 3 months and some suture will stay in for better crease permanently.. so i quite worried about having something inside ..
Yeah i really hope it will decrease by CNY because it look kinda high but shape very nice to me.. Hope we will recover soon since we did it on the same day . Did you eat anything other than pineapple after surgery for fast recovery ? I am on holiday till after CNY i go back work..
Before and after at 10th day..
Epi scar reddish and my left side is much more swollen than right..
Last edited by LadyVv on Sun, 14 Oct 2012 3:41 pm, edited 1 time in total. Anybody kind enough to post me some pics of chin augmentation? Does anyone know how much does Dr Chi charge? LadyVv wrote: I dont know leh.. I was giddy after the surgery my sister tell me the nurse say just apply on the "sticker" , Mine abit uneven only , one incision look really scar-less like tiny black line but one abit red but i everyday just keep on apply the thing he give me . I have been through it and i look real awful during the 1st month of recovery. I think the Epi scar will go down soon ? i tried to massage it & "push" it down while massaging it .. but i see it seems quite nice..and our epi incision look quite same so don't worry .. hope we will achieve nice eyes by 6th month ! Maybe u can try email Dr Chi and show him ur eyes? I been a lil worry about the height though.. Dr Chi say 70% of the swelling will go down by 1 month and slowly till 6th months.. Maybe i am quite paronoid.. i start to receive nice comments from friends and felt quite good .. I was so afraid that i head to Dr wong sy clinic but the reception lady say i am fine ask me there isnt a need for visiting the doc..just eat more vitamin E and pineapple so i felt quite relieved.. like big phew ! Really thanks I hope to have nice eyes down the road !! Anyone interested to go to Dr.Nara in May for my rhino? I planning to go on 12th of May, but i will be going alone. Hi guys, I'm thinking of going for a nose job in may with Dr Preecha (http://pai.co.th/) Anyone know how long does the recovery period take ?? As 1-10 pain rate , how painful is it 10 as high. =( Im anxious. Dont know if i spell it wrongly . Anyone had any info bout this Dr Kuldech in hatyai like his address etc . Heard his good n prices very reasonable similar to dr nara price range . Can somebody tell me, where can I buy Kelo-Cote scar gel In Singapore? You can try guardian or watson.. I using mederma and buying demertix soon because i feel that my epi scar is a lil raise and getting worried about it . Dr Chi recommend me Demertix if u can't find kelo-cote u can try that? The eyelid is healing quite well but i felt it swell more during the morning. Hope it will look less "thick" and swelling will still go down by at least 30% .. My epi is getting more raised Hope it will turn out well.. Tried putting on a lil eyeliner and mascara but hate the feeling of removing it so i kinda stop . Last edited by LadyVv on Sun, 14 Oct 2012 3:42 pm, edited 1 time in total.